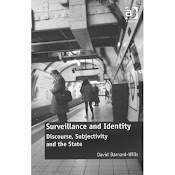 Research into Surveillance and Identity issues, by Dr David Barnard-Wills. The conference was the 'Cultures of Surveillance' hosted by the Autopsies Group at UCL. It ran from the evening of Thursday 29th through to the evening of Saturday 1st. (website here). There were keynotes from Tom Gunning (which I sadly missed) and from Simon Cole. Cole engaged with the mythology of the 'CSI' effect, finding little actual evidence for the supposed threat to the US juridical system by the television viewing habits of its population, but rather a large institutional perception of a problem and a number of responses. What was fascinating was the way that the media appeared to be adopting the critical stance of public understanding of science scholars. The editorial for a special section of Sociological Quarterly, by Torin Monahan is 'Surveillance as Cultural Practice'. I contributed a paper to this section, which looks at the ways surveillance is represented and discussed in the UK print news media, as well as making an argument about the importance of language in understanding surveillance (available behind a journal paywall here). I'd like to raise the editorial in the context of the UCL conference, because it speaks to several of things things I thought about during the event. Torin suggests that cultural studies of surveillance might be better placed to embrace reflexivity, and to be part of a useful expansion of the field beyond what he sees as its origins within sociological approaches and a focus upon institutional power dynamics. The article traces one version of the trajectory of surveillance studies, and it is a version which might well be useful to conference participants. The list of references would also be of particular use. The conference also left me thinking about research methods across disciplines, and in particular how this might affect a 'transdisciplinary enterprise' as Monahan calls surveillance studies. I'm convinced that cultural depictions and representations of surveillance practices are meaningful and important. But I think I need to think more about the methodological ways to integrate that. I think I know how to do political discourse analysis, and feel comfortable looking at the way groups talk or write about a practice such as surveillance. I don't quite yet know how to integrate the analysis of a film in terms of surveillance. To what extent does this privilege the perspective of a particular director, and if it does, why are we privileging that over somebody who does not have the cultural and financial resources to produce art? I suspect there might be resources within film studies to help me answer that. It's the sort of debate a discipline has with itself, but that might not be the sort of thing an 'outsider' looking to that discipline for inspiration would encouter. I'm encouraged by the spread of the concept of surveillance throughout a range of academic networks. Over the last couple of years I've been to conferences on surveillance where I didn't know most of the academics there, and its been exciting. I think it speaks to the purchase the concept has been getting in public life over recent years. Surveillance is a concern, but also potentially a paradigm. The other side of this diversity is that for many papers at such events, the particular work presented is often the author's first (and sometimes sadly last) engagement with surveillance. Without wanting to play at disciplinary gate-keeper (and not actually being able to) the danger is that such contributions tap up against the edges of the body of surveillance studies literature, appropriate the panopticon, or perhaps the synopticon, quote David Lyon, and then return to their own disciplinary home. Surveillance studies carries quite a few concepts and ideas that would be helpful - for example the discussions over the meaning of surveillance. My response would never be to exclude or disregard these contributions, because they've not read all the papers I've read. I think the role that those of us for whom surveillance is a core interests can play is to point such contributions towards those particular ideas and concepts that would help them the most. That requires engagement and participation. My suspiscion is that this works in both directions. Quite informative blog on Surveillance. I have been researching the politics of surveillance for few years now. my PhD thesis on the 'Articulation of Identity in UK discourses of Surveillance' was submitted to the University of Nottingham, and I graduated in March 2009. As a postdoc Research Fellow I previously worked at Cranfield University in the Department of Informatics and Systems Engineering and The Department of Political Science and International Studies, University of Birmingham. My current research includes issues of privacy and consent online, as well as continuing to research surveillance,identity, political theory, and the political and social impacts of information technology. I have also done some work on terrorism, counter-terrorism and international security. I Changed my surname from Wills to Barnard-Wills when I got married in 2009. David Wills is a younger me. Rowena Rodrigues, David Barnard-Wills, David Wright, Paul De Hert, Vagelis Papakonstantinou (2013) Privacy Seals Project: Inventory and analysis of privacy certification schemes. European Commission. David Barnard-Wills (2013) "Security, Privacy and Surveillance in European Policy documents", International Data Privacy Law, Vol. 3, No. 3, 170-180. David Barnard-Wills (2012) 'Identity in the UK: from Identity cards to E-ID' Hard Times, Deutsch-englische Zeitschrift, Nr. 92 Herbst 2012. David Barnard-Wills (2011) "This is not a Cyber War, it's a...?" WikiLeaks, Anonymous and the Politics of Hegemony.' The International Journal of Cyber Warfare and Terrorism. 1(1). David Barnard-Wills & Cerwyn Moore (2010) 'The Terrorism of the Other: Toward a Contrapuntal reading of Terrorism in India' Critical Studies on Terrorism, Vol.3, Issue 3. David Barnard-Wills & Debi Ashenden (2010) 'Public Sector Engagment in Online Identity Management' Identity in the Information Society, Vol.3 Issue 3. David Barnard-Wills (2010) ‘Book Review: B. Goold & D. Neyland (2009) New Directions in Surveillance and Privacy’ Information, Communication and Society. Vol.13, Issue 5. Cerwyn Moore and David Barnard-Wills (2010) 'Russia and Counter-Terrorism: A Critical Appraisal' in Siniver (ed) International Terrorism Post 9/11: Comparative Dynamics and Responses (London: Routledge). Jon Coaffee, Cerwyn Moore, & David Barnard-Wills (2009) ‘Lessons from Mumbai: Terrorism & Crowded Places’ RUSI National Security & Resilience Monitor. Royal United Services Institute. 'This is not a cyberwar it's a...?' Wikileaks, Annonymous and the Politics of Hegemony' paper at the ECIW 2011 conference, Talinn Estonia.